My first Comic-Con has been a blur. Things to see, play and write about have dominated my time in San Diego but one moment yesterday brought back into sharp focus why I love the transformative power of pop culture. I was rushing from one crush of people towards another while I was on the way to see or play about some other hotly-promoted entertainment experience. That's when I spotted a person in what appeared to be a homemade Speed Racer costume. I didn't talk to Speed Racer, other than to ask for his permission to take his picture. Didn't think to get his name or his story because, had I done so, I'm certain that tears would've started running down my face. And there's a chance that he could've misinterpreted those tears as pity. So I held them in. But what I felt wasn't pity. It was laughter, connection and respect. 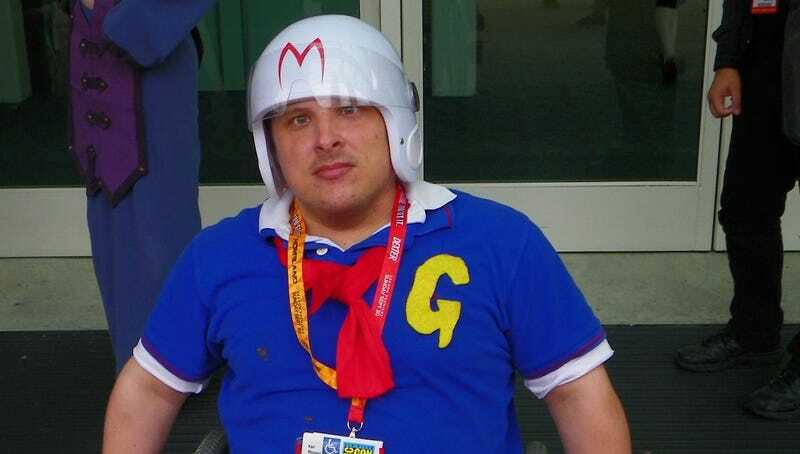 This stranger dressing up as Speed Racer reminded me of how comics, games, cartoons and other parts of nerd culture can provide escape, inspiration and a bond with others. It's an easy thing to lose sight of when people elbow each other out of the way for a free t-shirt or grouse about how a change to an action figure sculpt ruins everything everywhere forever. But Speed Racer rolled in front of me, a living avatar of the perseverance and transcendence the superheroes and outcasts of geek lore can symbolize. There are lots of reasons we show up and dress up for the Comic-Cons of the world. And Speed Racer reminds me of the best of them. Thanks, Speed, whoever you are.